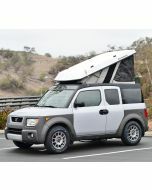 All 2WD Elements, and 2009 to 2011 Elements require installation of an access way into the pop-up camper. For Elements without a factory sunroof, we have a straight forward approach to creating the access way. We just install the OEM Honda sunroof frame and open up the sheet metal. We add additional steel reinforcement around the edge and the result looks stock when the camper is complete. The size and position of the access way is the same in all ECampers.